The following photo shows off the fifth (as well as sixth, seventh and eighth, I guess) game-related treasures I pulled from the closet of my childhood bedroom over the holidays. 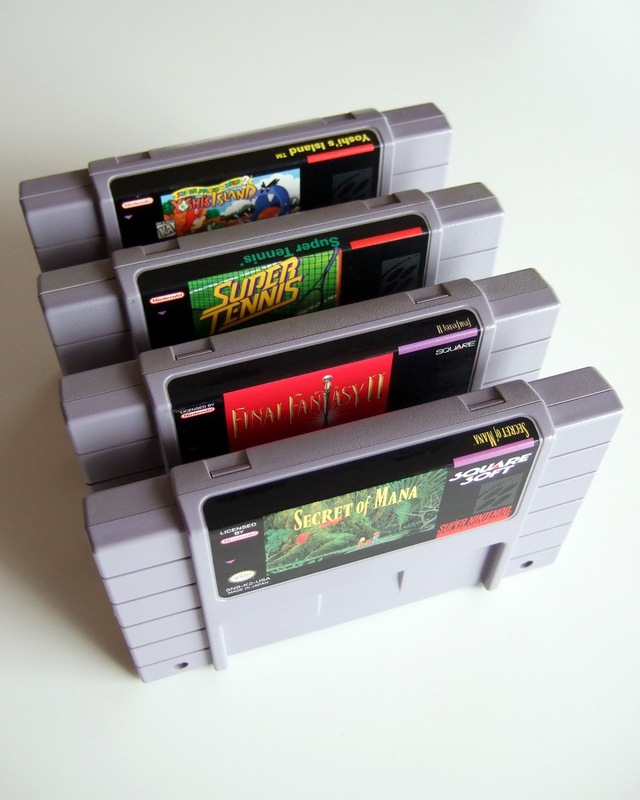 For those of you who can't quite make out the names of the SNES games in said snapshot, the one at the front of the line is Secret of Mana, followed by Final Fantasy II, Super Tennis and Yoshi's Island. Would you believe it if I told you these games are among my all-time favorites for Nintendo's 16-bit system? Well, it's true. Secret of Mana, for instance, will forever have a spot in my heart thanks to its lush graphics, laid-back soundtrack--and gobs of loot. Super Tennis, on the other hand, earned a place within my left ventricle (or is it my right one?) by bringing tons of late-night enjoyment to me and my childhood BFF during our frequent sleepovers. Anyway, as stoked as I was to dig these four titles out of my old closet, I was saddened that I didn't also find a few other SNES games I know I used to own, such as Chrono Trigger, Final Fantasy III, The Legend of Zelda: A Link to the Past, Super Mario Kart and Super Mario World. Oh, well, there's always eBay, right? Speaking of which, I'm going to need to pay a visit to everyone's favorite auction site at some point in the near future in order to pick up either an SNES or a Super Famicom system, as I'm currently unable to play any of the above-mentioned games. I know, Justin! I think I'm going to hold out for an actual SNES (or maybe Super Famicom) system, though. I've been meaning to buy one for a long time, so this should finally spur me to pick one up. You've never played ANY Final Fantasy game, Simon? How interesting! You really should play the SNES/Super Fami ones at some point, especially Final Fantasy V and VI. Well, you're certainly not alone in owning games you've never played, Simon. Don't get me started! I especially understand not being able to play RPGs as an adult. Who has the time? Argh! That said, you really should give FFV or FFVI a go at some point. You won't be disappointed! Or, I hope you won't. I figured you would. Nothing like the original. I know, I'm predictable in that way, aren't I? Sigh. Secret of Mana is one of my all-time favourite games, absolutely classic game. Super Tennis is a great game, really should get round to completing Yoshi's Island and never played Final Fantasy II. dste: I loooooooooove Secret of Mana. One of my all-time faves, too. It was a revelation to me when it was released. If you loved Secret of Mana, BTW, you *really* should play FFII sometime, too. It's also a great game. Not as good as FFV or FFVI, maybe, but still great in its own right. I've only ever played FFXIII which I played for about six hours and got bored with so stuck it on my sale/trade pile. I own III for the DS so will give that a shot at some point in the near future. dste: Well, I can't say for certain whether or not you'll become bored with FF IV, V or VI, but I can tell you this: Those FFs are nothing like the more modern ones. I can't stand modern FF, just so you know. So, I'd still recommend that you try at least one of the old FFs. Personally, I'd try either V or VI.